If you have ever listened to a tech radio show or watched on on TV, chances are if they talked about a registry cleaner then they mentioned JV16 Power Tools. JV 16 Power Tools is one of the leading registry cleaners in the world but many people do not know about it because it’s not really promoted that well. The truth is this product kind of falls between the cracks on most registry cleaner review sites. Don’t let that fool you. This is one of the top registry cleaning products of all time and even those who dislike registry cleaning products will admit the JV16 Power Tools is something very sweet. In the past we were unable to recommend this product because it was way to technical to use. You need something you can just install and hit a few buttons and be done. 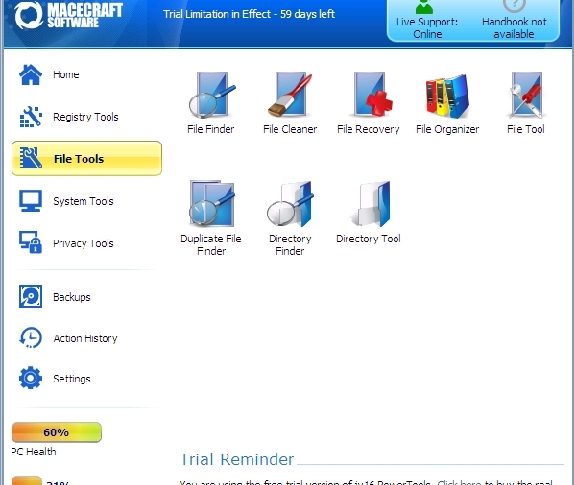 The latest JV16 Registry cleaner from Macecraft, blew our socks off! It’s a lot more user friendly then past versions. Still a bit complicated overall but now the average user can move around in the interface and get things done. Because this registry cleaner offers a fully functional 30 day trial you get to test out all features before you make a purchase. 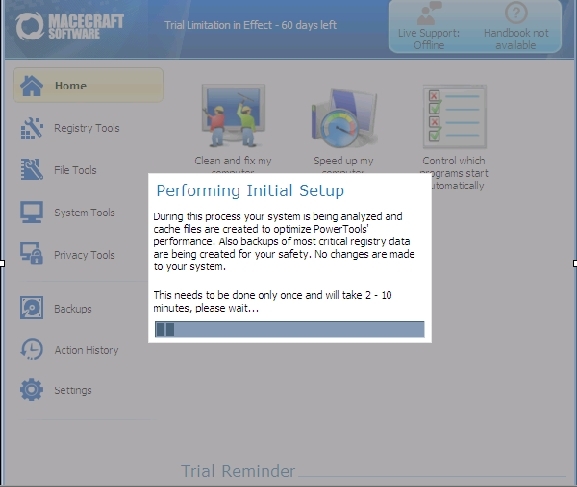 After you install JV16 PowerTools the program will automatically build a profile of your computer. It is basically collecting data about the system so it knows what to analyze. During this phase a backup is created for the registry. It can take 1-10 minutes depending on the speed of your computer and how much use the computer has had over the years. The Home screen has several options. This is were you are going to get the biggest speed boost on your computer. “Clean And Fix My Computer” searches for invalid registry settings and obsolete files that would otherwise take up space and slow down system performance. “Speed Up My Computer” tweaks general system settings, such as 8.3 file support and NTFS Last Access Times, which are used to track timestamp’s and compatibility support for DOS applications, among other settings that can slow down system performance on more specialized systems. “Control Which Programs Start Automatically” is similar to msconfig.exe, spend more time in this section and un-check every program you do not want to auto-start when your computer boost up. Just disable the program so it does not start when your computer does. You should only stop processes/programs that you recognize. You do not want to stop everything from running as it will cause issues. If you are un-sure if you want a process to start try to do a search online for the name of the file and see what program it belongs to. Then you can make an informed decision. “Fully Remove Software And Leftovers” This program let’s you remove programs that you were unable to uninstall normally through Windows. Rather a nice interface. “Verify My Downloads Are Safe To Run” is an optional security feature wherein JV16 PowerTools searches for commonly used download folders and scans them for any possible malware, which the user might not normally be aware of. 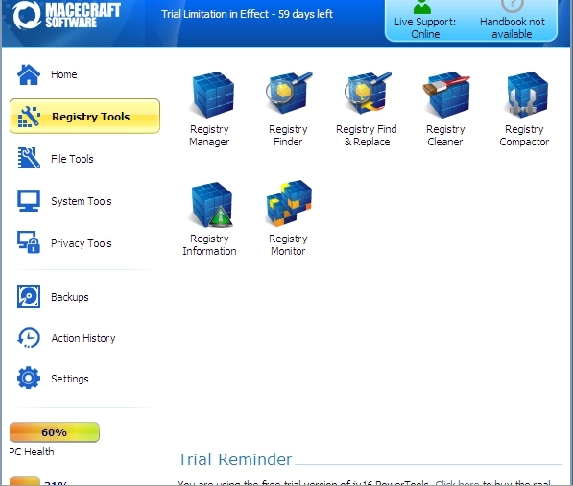 For the most part you will only be using the Registry Cleaner option and perhaps the registry compactor. The rest of the tools are a little more complicated and not needed for the average end user. 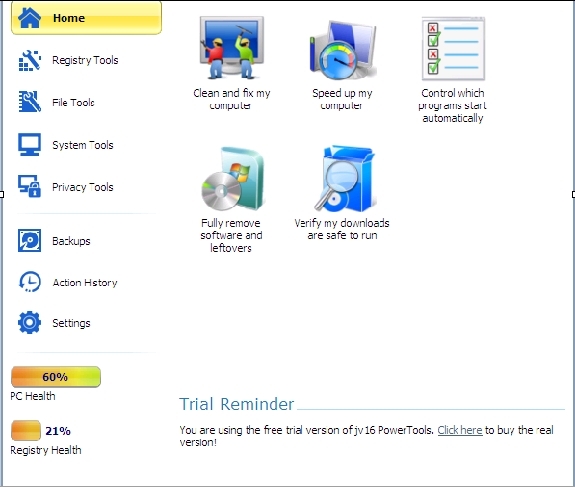 The registry cleaner of JV16 Powertools is one of the better registry cleaners on the market. The File Tools section is another one of those places that most end users will not be needing to use. They have some great tools in there but most don’t pertain to the average user. You may however find the duplicate File Finder a good tool to use. If you think you have dozens of the same video, music file or pictures on the computer but only need 1 copy of them this is a great tool to use to remove or at least locate all the duplicate files on your computer. All in All I really like JV16 Power Tools. I own the 5 commercial license pack and have Platinum status. This makes me eligible for free product updates for life. Very nice way to go if you always want to have a registry cleaning product with out ever having to pay again. The upgrade license’s is by far the best value. Yes you are paying a premium but you also get the product for life. The cost of JV16 Power Tools depends on the license you purchase. The cost is as low as 29.95 and goes up from there.